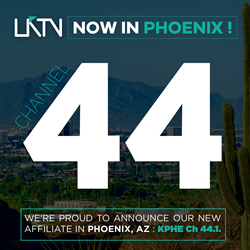 LATV Networks, the original national bi-cultural television network, announced today that it will be launching on KPHE digital channel 44.1 in the Phoenix-Prescott, Arizona media market. “Adding this important media market that represent over half a million new Hispanic homes to LATV's network of affiliates is a real validation of our programming and distribution strategy,"
LATV Networks, the original national bi-cultural television network, announced today that it will be launching on KPHE digital channel 44.1 in the Phoenix-Prescott, Arizona media market, beginning on January 1st, 2016. LATV programming will also be carried by Cox Cable Channel 405 and CenturyLink Prism Cable Channel 44. This addition brings LATV’s reach up to 47 Designated Media Areas, all top 60 national Nielsen markets based on Hispanic homes, representing over 14 million U.S. Hispanic households. About LATV: LATV is the only remaining Latino-owned TV network in the Hispanic television space. Its programming primarily targets U.S.-born Latinos and the coveted bi-cultural 18-49 Latino demographic, with content that features a combination of originally produced shows as well as licensed content that has never before been seen in the U.S.
For more information, please go to http://www.LATV.com and http://www.AmericanLatino.tv.